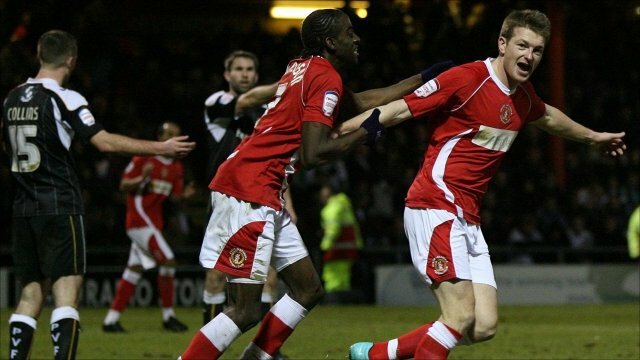 Crewe closed the gap on the automatic promotion places to three points with victory over local rivals Port Vale. Crewe were ahead when Clayton Donaldson cut the ball back for Shaun Miller to score his 12th goal of the season. Vale's equaliser came shortly after half-time as Justin Richards was brought down in the area and he converted the resulting penalty. But the Alex won the derby when substitute Adam Dugdale headed in from close range to seal the points. "They were remarkable because I've been worried during the week that they've looked jaded. "The energy they showed was tremendous. "I thought we deserved the win, without playing well all the time." "It would be too easy to say that it's my style of football that's made a change. "You've got to remember that this team, before I took over, had lost three games in a row and struggled to finish off Burton. "There's a larger problem here and we need to go back to basics." 93:41 The game is over, as the referee blows his whistle. 90:00+2:13 Byron Moore decides to take the corner short. 90:00+0:13 The ball is crossed by Danny Blanchett, Effort from inside the area by Nick Powell misses to the right of the goal. 89:59 Byron Moore takes a shot. Save by Stuart Tomlinson. 87:53 Foul by Clayton Donaldson on Lewis Haldane, free kick awarded. Lee Collins takes the free kick. 86:56 Lewis Haldane gives away a free kick for an unfair challenge on Danny Blanchett. Direct free kick taken by Danny Blanchett. 86:56 Booking Lewis Haldane is shown a yellow card for unsporting behaviour. 85:12 Substitution Shaun Miller leaves the field to be replaced by Nick Powell. 84:48 The ball is swung over by Kris Taylor, Adam Yates produces a right-footed shot from deep inside the penalty area which goes wide of the left-hand post. 84:18 Kris Taylor takes a shot. Save made by Rhys Taylor. 81:59 Substitution Kris Taylor is brought on as a substitute for Sam Morsy. 80:44 Luke Murphy decides to take a short corner, assist on the goal came from Danny Blanchett. 80:44 GOAL - Adam Dugdale:Crewe 2 - 1 Port Vale Adam Dugdale finds the net with a headed goal from inside the penalty box. Crewe 2-1 Port Vale. 78:59 Unfair challenge on Byron Moore by Adam Yates results in a free kick. Adam Dugdale takes the free kick. 78:25 Shot from just outside the box by Clayton Donaldson misses to the left of the target. 77:35 Substitution Gary Roberts leaves the field to be replaced by Tommy Fraser. 77:24 Byron Moore sends in a cross. 76:29 Gary Roberts takes a shot. Save by Rhys Taylor. 75:47 Corner taken left-footed by Danny Blanchett from the right by-line, Sam Morsy manages to make a clearance. 74:07 Substitution (Port Vale) makes a substitution, with Kristian Cox coming on for Justin Richards. Correction - 73:07 Corner from the right by-line taken by Danny Blanchett, clearance made by Anthony Griffith. 73:07 Danny Blanchett takes a inswinging corner. 72:01 Foul by Anthony Griffith on Clayton Donaldson, free kick awarded. Free kick taken by Lee Bell. 70:18 Effort from outside the penalty box by Gary Roberts goes wide left of the target. 67:54 Lee Bell fouled by Sam Morsy, the ref awards a free kick. Adam Dugdale takes the direct free kick. 66:43 Corner taken by Luke Murphy, Header by Adam Dugdale from deep inside the penalty area misses to the right of the target. 66:35 Ashley Westwood crosses the ball, Gareth Owen manages to make a clearance. 65:05 The ball is crossed by Matt Tootle, Lee Collins makes a clearance. 62:48 A cross is delivered by Byron Moore, Anthony Griffith manages to make a clearance. 60:50 Unfair challenge on Matt Tootle by Gary Roberts results in a free kick. Danny Blanchett restarts play with the free kick. 60:50 Substitution David Artell goes off and Adam Dugdale comes on. 60:50 Booking Gary Roberts shown a yellow card. 59:52 Unfair challenge on Anthony Griffith by Clayton Donaldson results in a free kick. Stuart Tomlinson restarts play with the free kick. 59:08 Corner taken right-footed by Danny Blanchett, Anthony Griffith manages to make a clearance. 57:34 Booking Rhys Taylor is cautioned. 57:18 Penalty awarded for a foul by Rhys Taylor on Justin Richards. 57:18 GOAL - Justin Richards:Crewe 1 - 1 Port Vale Justin Richards scores a penalty. Crewe 1-1 Port Vale. 55:38 Shaun Miller is penalised for handball and concedes a free kick. Stuart Tomlinson takes the free kick. 54:09 Shot by Robert Taylor from outside the box goes over the net. 53:33 Centre by Robert Taylor. 52:56 Handball by Lewis Haldane. Direct free kick taken by Rhys Taylor. 52:00 The ball is swung over by Luke Murphy, John McCombe manages to make a clearance. 51:28 Luke Murphy decides to take a short corner. 49:38 Corner taken right-footed by Gary Roberts. 49:16 The ball is crossed by Gary Roberts, Robert Taylor takes a shot. Save by Rhys Taylor. 48:21 Justin Richards challenges David Artell unfairly and gives away a free kick. Rhys Taylor takes the free kick. 47:21 Anthony Griffith has an effort at goal from outside the box which goes wide left of the goal. 46:29 Matt Tootle delivers the ball, clearance by Justin Richards. 45:20 Corner from the right by-line taken by Luke Murphy, clearance made by Lee Collins. 45:00+1:11 The players leave the pitch at half time. 44:47 Corner from the right by-line taken by Robert Taylor, Unfair challenge on Patrick Ada by Gareth Owen results in a free kick. Rhys Taylor takes the direct free kick. 43:07 Luke Murphy produces a cross, Gareth Owen manages to make a clearance. 42:04 Anthony Griffith is penalised for handball and concedes a free kick. Direct free kick taken by Lee Bell. 41:00 Danny Blanchett crosses the ball, John McCombe manages to make a clearance. 38:33 Inswinging corner taken right-footed by Gary Roberts from the left by-line to the near post, save by Rhys Taylor. 37:01 Robert Taylor has an effort at goal from just inside the box that misses to the right of the goal. 36:00 Danny Blanchett delivers the ball, Gareth Owen manages to make a clearance. 34:03 The ball is crossed by Danny Blanchett. 32:59 Lee Bell challenges Anthony Griffith unfairly and gives away a free kick. Stuart Tomlinson restarts play with the free kick. 32:19 Corner taken right-footed by Luke Murphy to the near post, Lee Collins makes a clearance. 30:21 Unfair challenge on Sam Morsy by David Artell results in a free kick. Gary Roberts produces a strike on goal direct from the free kick, save made by Lee Bell. 27:09 Clayton Donaldson takes a shot. Save made by Stuart Tomlinson. 26:32 Sam Morsy sends in a cross, Matt Tootle manages to make a clearance. 26:13 Free kick awarded for an unfair challenge on Justin Richards by Patrick Ada. Free kick taken by Gary Roberts. 24:34 Lee Bell fouled by Sam Morsy, the ref awards a free kick. Danny Blanchett restarts play with the free kick. 24:03 Sam Morsy gives away a free kick for an unfair challenge on Clayton Donaldson. David Artell takes the free kick. 23:56 Adam Yates delivers the ball, clearance made by Patrick Ada. 23:22 Corner taken right-footed by Gary Roberts from the right by-line, Luke Murphy manages to make a clearance. 22:25 The ball is swung over by Byron Moore, clearance made by Gary Roberts. 21:29 The ball is delivered by Justin Richards, Lee Bell makes a clearance. 20:11 Danny Blanchett takes a short corner. 19:56 Byron Moore produces a cross, clearance by Lee Collins. 18:49 Gary Roberts fouled by Ashley Westwood, the ref awards a free kick. Free kick taken by Gary Roberts. 17:34 Assist by Clayton Donaldson. 17:34 GOAL - Shaun Miller:Crewe 1 - 0 Port Vale Shaun Miller scores a goal from inside the penalty area to the bottom left corner of the goal. Crewe 1-0 Port Vale. 12:49 Centre by Robert Taylor, clearance by Ashley Westwood. 12:18 Shot by Lewis Haldane from deep inside the penalty area misses to the right of the goal. 12:03 Lewis Haldane crosses the ball, clearance by David Artell. 11:16 Robert Taylor concedes a free kick for a foul on Clayton Donaldson. Direct free kick taken by Rhys Taylor. 10:42 The ball is swung over by Danny Blanchett, clearance made by Gareth Owen. 9:37 Centre by Robert Taylor. 7:57 Inswinging corner taken left-footed by Robert Taylor, Foul by Lee Collins on Lee Bell, free kick awarded. Rhys Taylor restarts play with the free kick. 6:30 Effort from outside the penalty box by Justin Richards goes wide right of the target. 4:58 Lewis Haldane crosses the ball, clearance made by Lee Bell. 3:15 The referee blows for offside against Byron Moore. Stuart Tomlinson takes the free kick. 0:46 Gareth Owen concedes a free kick for a foul on Clayton Donaldson. Direct free kick taken by Matt Tootle.